Warren Buffett's Berkshire Hathaway is having an unusually bad year, but this should be viewed as an opportunity. Warren Buffett's Berkshire Hathaway (NYSE:BRK-A) (NYSE:BRK-B) has delivered an outstanding track record of performance, mainly by beating the market during the bad times, and delivering decent performance when the market was doing well. However, 2015 has been a rather uncharacteristic year for Berkshire -- the overall market hasn't done great, but Berkshire has done even worse. Should investors be worried? Thanks to Buffett's style of choosing investments and acquisitions that can perform well in any economic environment, Berkshire is well known for its record of strong performance even when the overall market struggles. For example, in the year 2000, the S&P 500 lost 9.1% of its value, mainly because of the dot-com collapse. Berkshire, which has largely avoided tech stocks, saw its share price rise by 26.6% that same year. The market also declined in 2001 and 2002, and Berkshire outperformed the S&P in both years. In contrast, Buffett has cautioned investors to expect lackluster performance when the market soars. In 2009, as the S&P gained 26.5% as it recovered from the financial crisis, Berkshire's share price increased by just 2.7%. This strategy has produced some incredible gains over time, as beating the market during the bad years is far more important to long-term success than outperforming when the market is rising. To illustrate this, consider two stocks, both trading for $50. The first loses 40% one year, but then rebounds strongly, gaining 50% in both the second year. The second loses 20% the first year, but gains just 25% in the following year. Which will finish higher? The answer may surprise you. In the first case, the stock drops to $30, but then rebounds by 50% ($15) to $45 by the end of the second year. However, the second stock, which lost less and therefore had less ground to make up, only dropped to $40, so its 25% gain brought it all the way back to $50. So, even though a 50% gain might sound impressive, the less volatile stock comes out ahead. 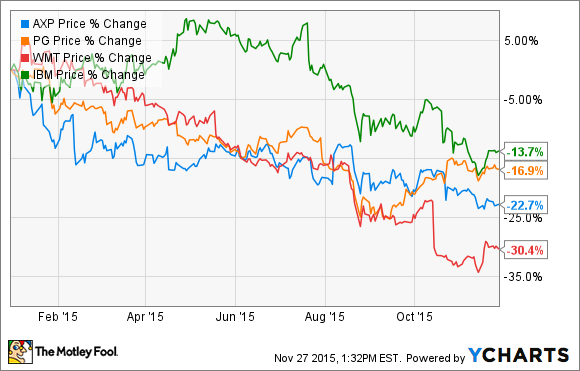 Unfortunately, 2015 has been a rare year for Berkshire. The S&P is up by just 1.4% so far in 2015, and has been in the red for a considerable period of time lately. However, Berkshire's share price has declined by about 10%. This is rare for Berkshire, but isn't completely unprecedented. In 1990, for example, the S&P dropped by 3.1% and Berkshire lost 23.1% of its value. My short answer is no, Berkshire isn't in any trouble. Far from it, actually. The decline in Berkshire's share price is the result of a combination of adverse market factors, none of which should be permanent. For starters, energy prices were hit hard, and a large portion of Berkshire's business is railroads, which transport oil and coal. Also, many of Berkshire's individual stocks have performed poorly. American Express, Berkshire's fifth-largest stock holding, is down by nearly 23% in 2015 in the aftermath of losing its Costco partnership. IBM has had a particularly difficult year, down 13.7%, and this one hits Berkshire particularly hard because the company invested $13 billion into big blue during the past four years. Finally, Berkshire's seventh and eighth largest stock holdings, Procter & Gamble and Wal-Mart, have performed terribly, as well, down 17% and 30%, respectively. Buffett has emphasized that the declines are temporary, and these companies still represent solid long-term investments. For example, in the case of IBM, Berkshire said, "We expect that the fair value of our investment in IBM stock will recover and ultimately exceed our cost." Still, 2015 has been a perfect storm of bad news, albeit temporary, for Berkshire Hathaway's investment portfolio. However, Buffett has a knack for setting Berkshire up for long-term success when times get rough, and I don't think this time will be any different. The recently announced Precision Castparts acquisition could prove to be an excellent long-term move, and Berkshire has added significantly to some of its positions -- most notably General Motors and Twenty-First Century Fox. Additionally, even in years when the company's stock performs poorly, its intrinsic value generally rises, and so does the company's future earning potential. In fact, in 1990 -- the last time Berkshire's stock price fell during a poor market year -- the company's per-share book value actually increased by 7.4%. And after the dismal performance of that year, the stock dramatically outperformed the market for the next five years. 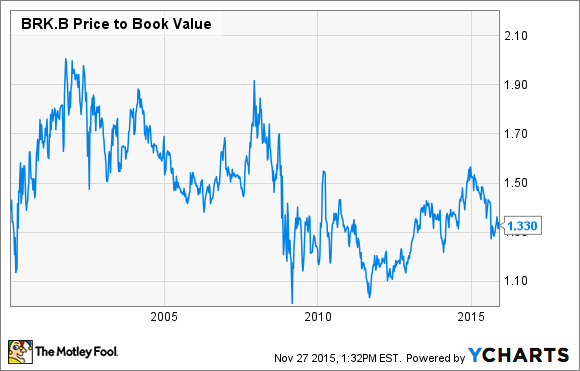 In total, Berkshire's book value per share has risen in 48 of the first 50 years of the Warren Buffett era. Finally, and perhaps the most compelling reason why I'm sticking with Berkshire -- and actually considering buying more shares -- is the company's valuation. Berkshire's price-to-book multiple of 1.33 is the lowest it's been in nearly two years, and is toward the lower-end of the long-term historical average. Buffett has said that Berkshire would begin buying back shares at a P/B multiple of 1.2, which implies that he would consider the company to be significantly undervalued at that level. In the 2014 shareholder letter, Buffett implied that a good entry point would be when shares are approaching the P/B multiple that would trigger buybacks, which is certainly the case right now. In his most recent letter to shareholders, Warren Buffett cautioned that Berkshire would be unlikely to repeat the incredible performance of the past 50 years going forward, but that he remains confident in the company's ability to beat the market. And I agree. Berkshire's business model is a long-term winner, and Buffett and company are the best stock pickers in the game. In fact, Berkshire's stock-picking duo of Todd Combs and Ted Weschler have made Berkshire "billions already that we wouldn't have otherwise made" according to Buffett. In a nutshell, investing in Berkshire is essentially equal to purchasing a well-diversified portfolio run by the best minds in the business. I look at the current situation simply as an opportunity to load up on one of America's strongest companies at a lower valuation. I look forward to seeing what the future holds for Berkshire.